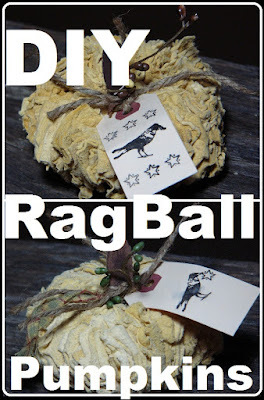 I purchased a dozen of these drying rag balls, made by the Good Year car brand from the auction last Saturday for $2.00. So I have about 16 or 17 cents in each. They are made to use as a drying rag ball for windows and such. But as soon as I saw them I had other plans. 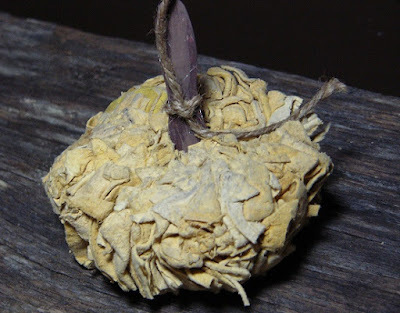 I pictured them as cute little primitive pumpkins because of their shape. I first painted my wooden ice cream spoons a brown color to make them look like little stems. And I tied some jute string around them and just stuck them inside the little rag ball. I noticed some had dis-colorization on the tops. I bet this is why they were cheaper. Then I used the Manila tags, stamp and ink and stamped up some cute tags to tie on them. I thought an ole crow would be Halloweenish~. And then I just put it all together. And I put them in a brownish/yellow colored enamel pan for display. I think I am going to price these for $3.00 each in my local co-op craft booth. Not a bad profit for an item that ended up costing me about 16 cents each! And I got a case of 12. I so wish I would've gotten more now! Ah, maybe next time. I did an internet search and found a dozen of these on eBay for $11.99 if anyone is trying to find them for this craft. Once again a really impressive make, you certainly have an eye for a bargain.